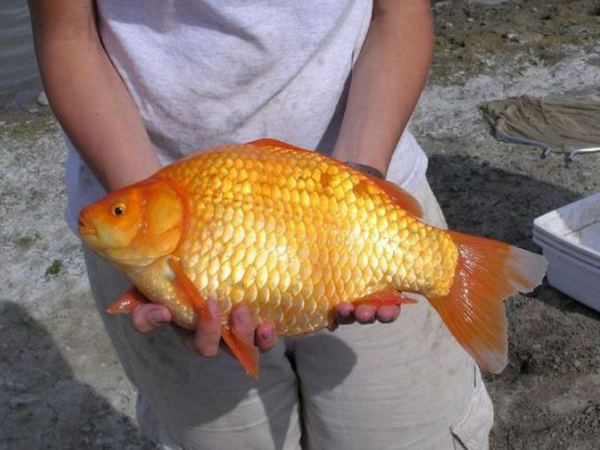 Dumping of live goldfish into the ecosystem has resulted in freakishly large fish, wildlife officials in Canada say. Goldfish are apparently a particularly invasive species of fish and they have no natural predator, causing them to grow quite big and thrive in the wild. “That's the crazy thing about domestic aquatic pets, you have them in your aquarium and they are this cute little thing and then you release it into the wild and that constraint of size and food is gone and because of that some of these species can get really big," says Kate Wilson, of Alberta Environment and Parks in Canada. The four generations of goldfish pictured above were found in cold, harsh, low-oxygenated waters off the coast of Canada – where they still managed to flourish. "The biggest one we've caught is the size of a dinner plate," Kate says. Wildlife expert Kate says her “biggest concern is (that) people are doing this because they think it's the humanitarian thing to do. We really need to correct misinformation." If you have grown tired of your goldfish companion the best thing to do is contact a retailer and enquire about a return, donate the pet or speak to your vet about how to get rid of the fish in the best way possible.